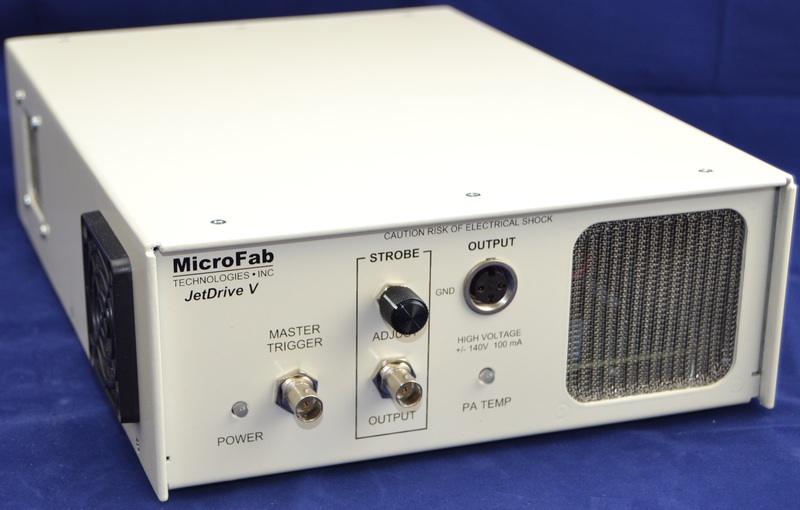 The JetDrive™ V drive electronics, built on the robust JetDrive™ III architecture, is designed to provide complex drive waveforms to MicroFab’s MJ microdispensing devices. 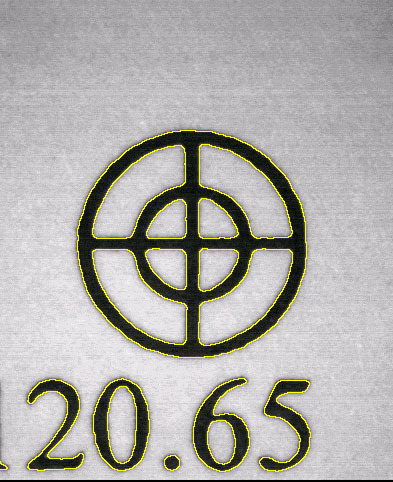 It is computer controlled via USB communication and an external trigger is provided for real-time control during printing operations. An output to drive an LED strobe for drop observations is also provided, including a delay that is controlled either through the computer interface or a knob on the front panel. A Windows® based control program (JetServer™) is provided, along with the command set for customers who want to integrate control of the JetDrive™ V into their own software. An optional LabView® sample program is available. The JetDrive™ V comes in single output configuration for now. The multiple output configurations of JetDrive™ V will be available in near future. Till then the JetDrive™ III will be offered in multiple output configurations only. 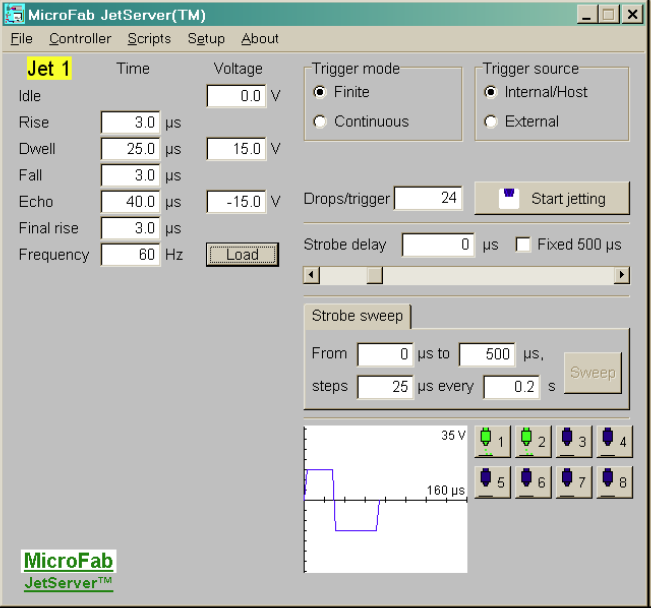 The JetServer™ program is designed to control the JetDrive™ V and III family of drive electronic units. A graphical user interface is provided to set the operating parameters for MJ piezoelectric dispensing devices. These can be saved and retrieved interactively in a format fully compatible with the control program of Jetlab® Printing Platforms. Multiple MJ devices can be controlled using a multi-channel version of the JetDrive™ III or a single-channel version of the JetDrive™ V unit multiplexed by a relay board. With optional frame grabber hardware and image processing software, automated measurements of drop diameter, drop velocity and direction in one camera view can be performed. The Windows® version of JetServer™ ships with each JetDrive™ unit. A LabView® sample version is available as an option. surveying of printed spot patterns (Jetlab® Printing Platforms, CT-VC-core).